Pergolas are a great way to improve your outdoor living experience and add a little something something to your yard. These simple structures can be made to fit your tastes and can do a lot for any area. Pergolas are a great way to improve your outdoor living experience and add a little something something to your yard. These simple structures can be tailormade to fit your space and tastes and can do a lot for any area. Here are some reasons why you should consider adding a pergola to your property. Pergolas add definition and a focal point to any yard. If you don’t already have a deck or patio, they are an excellent way to extend your outdoor entertaining space. Not everyone wants to be fully out in the open in their yard, but not everyone wants a huge privacy fence either. If your privacy needs are somewhere in the middle, consider investing in a pergola. While they are open structures, you can add drapes, curtains, latticework, and anything that suits you to one or multiple sides to get the amount of privacy you want. Add an additional open air space for plants that need shade. Or opt for beautiful hanging flowers and vines to create a truly beautiful space. You can even use vines to create a beautiful natural ceiling that will wow your guests. Nothing is worse than sunburn in the summer heat. Create a safe and shaded space where you can enjoy the outdoor weather. Pergolas can even have canopies which you can close and open as you feel the need to. Attractively done and appropriate landscaping can add as much as 20% to the value of your home. While there are many expensive ways to do that, pergolas are a relatively affordable way to reap the benefits of a beautiful yard. They add beauty and interest without breaking the bank. These affordable structures can be made from different materials with different looks at different price points. There is truly something to suit every taste and budget when it comes to pergolas. 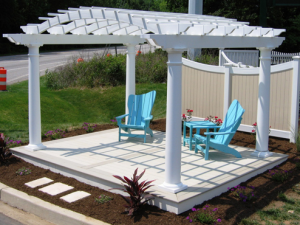 Work with Mid-Atlantic Deck & Fence today in order to achieve the perfect pergolas for your property! Mid-Atlantic Deck & Fence has almost 30 years of experience in building beautiful custom fences, gazebos, screened-in porches, and decks throughout the state of Maryland. We have the expertise to design your dream fence or custom deck and have it installed in a headache-free process. Give us a call at 1-800-833-9310 or visit us online for a quote today! We offer many different styles of fencing and decking in addition to custom options designed specifically to suit your preferences and tastes. To see examples of our work and get more tips on how to choose the right gazebo for your family, follow us on Facebook, Twitter, Houzz,Pinterest, Google+, YouTube, and LinkedIn.